Discover what Smart WiFi can do for you. Your customers are there, now put their data to work for you! Hosting packages - Three powerful platforms that work independently or together as a suite. How will the service affect my Internet protection/security. Free World Wifi’s Access Points are actually more secure than your standard router. Our routers have built in encryption and security acting as a firewall. Installation of Free World Wifi equipment is simple and easy. Free World Wifi routers are “Plug-and-Play” ready. This means that all you have to do is plug the device into your existing modem or router for it to work. You can install the equipment yourself, or we can have a local technician install the equipment for you. I'm a Airbnb host, can I control the WiFi without going to the property? Absolutely! Free World WiFi Access Points can be controlled from anywhere in the world. You can monitor real time usage and you have control over passwords, access times, access speeds and MB of downloadable data. You can also restrict specific websites as well as specific users. I have a food truck and want to offer free WiFi to my customers as well as advertise future locations and specials. What do I need? Our plans include a smart WiFi controller that will supply all of the cool marketing functions like showing your specials on the Splash Page, branding, data collection, automated e-mails, etc. You will simply need to tether our controller with a standard “hotspot” from a mobile carrier. You will need a data plan add-on from your carrier and we recommend an LTE connection only. The carrier-supplied Hotspot should be capable of USB tethering. Check with your carrier to select the best plan and USB-tethered device. What is WiFi Marketing and why would I need it? WiFi Marketing is communicating with customers and prospects directly through their use of a company’s free or guest WiFi. It traditionally includes branded login pages, content delivery, email marketing, social media interactions, promotions, and data collection. Think you’re too small to need marketing? Think again. Small business and start-ups must encourage repeat visits, positive reviews, and quickly connect to future customers. WiFi marketing allows you to do all that right from the guest WiFi you’re offering for free. From coffee shops and car dealerships to airports and arenas, guests check to see if free WiFi is available almost as soon as they walk through the door. Businesses of all sizes can increase retention, encourage return visits, cross-sell and up-sell promotions, deliver content, and drive revenue and by marketing through the WiFi connection guests are already connecting to. What's up with the "No Password" thing? Free World WiFi is secure, but password-free. We allow guests to access WiFi without a password, so it is a simpler process for them, while at the same time, does not compromise security. Our router technology isolates your guests from your router and computers, as well as from each other. This makes it convenient for customers, by eliminating any frustration they would have by not knowing what the password is, or mistyping it. Additionally, you will avoid needing staff to repeatedly inform them of a password. No problem! Drop us a line and we would be happy to answer all your questions. Unleash the power of your Wifi hosting. See how the Wifi you give away for free can work for you and become your very own marketing machine. Free World WiFi’s managed WiFi solutions provide free updates support, monitoring and security compliance so you can be sure you’re guests are getting the best fully managed service available. We promote our daily specials primarily on Free World Wifi. Customers come in asking for our Wednesday Guacamole night...our most popular night every week! Our staff always had to contact our IT department to get the password for our clients. Because of Free World Wifi, our clients can easily access the Internet without requiring a password. Our viewership has expanded dramatically since partnering with Free World Wifi. We couldn't be happier with this service. Free World Wifi is the best way to advertise to modern consumers and you're in good hands with their marketing team! I highly recommend it! Excelente. La gente le gusta mucho. Sobre todo por no usar "password". Because of Free World Wifi, our customers can take photos of our jewelry and send it to friends and family, which has increased our number of sales. Our ads on Free World Wifi have dramatically improved the visibility of our Airbnb.com listing. Bookings are up 50% from last year! My business is too small for WiFi Marketing. Myth. Small business and start-ups must encourage repeat visits, positive reviews, and quickly connect to future customers. WiFi marketing allows you to do all that right from the guest WiFi you’re offering for free. If it's password-free, it's not secure. Myth. We allow guests to access WiFi without a password, so it is a simpler process for them, while at the same time, does not compromise security. This makes it convenient for customers, by eliminating any frustration they would have by not knowing what the password is, or mistyping it. Additionally, you will avoid needing staff to repeatedly inform them of a password. I don't need free Wifi for my customers. Myth. People depend on internet connectivity. If a customer is choosing between two restaurant venues, they will be more likely to consider places that provide free WiFi. If your venue is one of them, that will likely increase your business, especially if your competition doesn’t have WiFi. Even large enterprises find a customer experience value in offering guest WiFi. Marketing WiFi just bugs customers. Myth. Marketing Wifi connects businesses to customers, and future customers, when they’re most receptive to marketing. .
My business is not a "good fit" for this kind of marketing. Myth. From retail shops and car dealerships to airports and arenas, guests check to see if free WiFi is available almost as soon as they walk through the door. 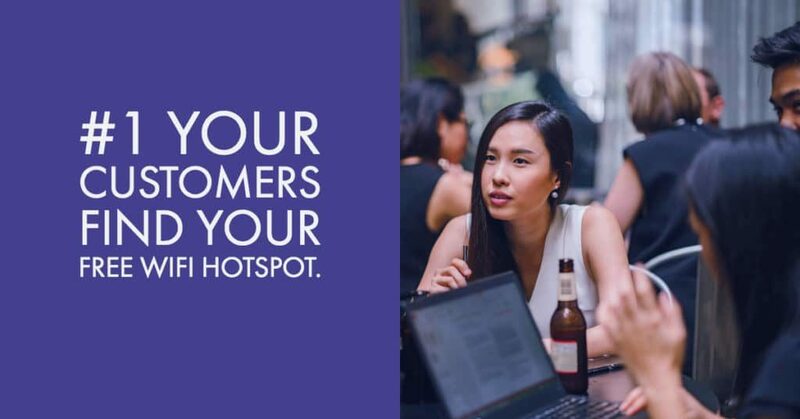 Businesses of all sizes can increase retention, encourage return visits, cross-sell and upsell promotions, deliver content, and drive revenue and by marketing through the WiFi connection guests are already connecting to. I'm going to need additional WiFi Infrastructure. Myth. Free World WiFi platforms are hardware neutral. What does that mean? You’re already using a router to deliver free WiFi to your customers, our hosting and marketing packages come with a Smart WiFi controller. Just plug it in, and you’ll be building your customer list in minutes. How Much Does a WiFi Marketing Plan Cost? The costs of WiFi marketing automation software and WiFi marketing plans vary greatly. We offer a free Starter Plan that allows our customers to see the benefits of WiFi marketing before they decide to upgrade. Once you see the potential ROI of WiFi marketing, we think you’ll see a WiFi marketing plan as less as a cost and more as a profit center. Lets schedule a Demo and an ROI consultation!